The ViscoStar III incorporates automated thermal bridge tuning to ensure perfect bridge balance every run, a patented pump pulse suppression system that eliminates pressure fluctuations due to the pump without loss of chromatographic resolution, and dual-Peltier thermal control for optimal isolation of the temperature-sensitive bridge from room temperature variations. A highly sensitive, on-line differential viscometer used in conjunction with SEC-MALS to determine the size and conformation of all types of biopolymers, synthetic polymers and even proteins and peptides. 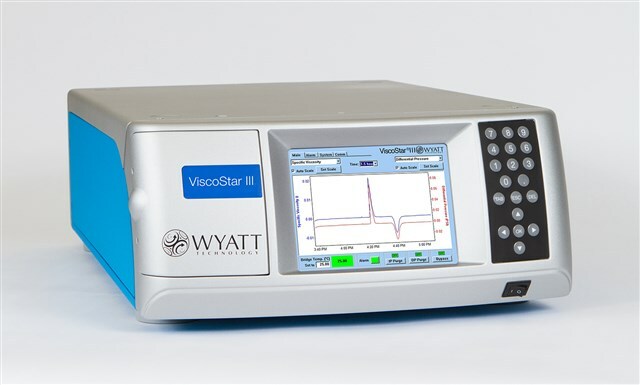 The ViscoStar® III incorporates multiple novel technologies to provide the highest sensitivity, stability and solvent compatibility of any available viscometer for GPC. Its ease-of-use and serviceability make it the perfect companion for Wyatt's DAWN® HELEOS® II light scattering and Optilab® T-rEX refractive index detectors. When coupled with size-exclusion chromatography and a concentration detector such as the Optilab T-rEX, the ViscoStar III derives the intrinsic viscosity (IV) of polymers. An inherently valuable physico-chemical property in itself, IV is best utilized together with molar mass information from multi-angle light scattering (SEC-MALS-IV) to derive the hydrodynamic radius, conformation, and branching ratio of a macromolecule in solution. There are no threads in Wyatt Technology ViscoStar III Reviews at this time.